I almost took the easy way out this month and was going to choose sewing my Meadowland Blocks into a quilt top as my April ‘19 One Monthly Goal, but honestly I hope to have that quilt top done by April 7th to enter into the final #meadowlandqal drawing hosted by Then Came June. So it felt a little like cheating, since it’s likely that I will get this quilt top done this coming weekend. So I decided to pick a different OMG that will be more of a stretch for me. I’m going to make two pillow covers using Pen + Paper Pattern’s Travel Trailer block. One I will giving to my brother and sister-in-law to go with their Camping Quilt, and the other will be for my friend, Sharon, who is a new travel trailer owner. I just bought the PDF pattern yesterday and will start choosing fabrics for these pillow covers in the next few days. 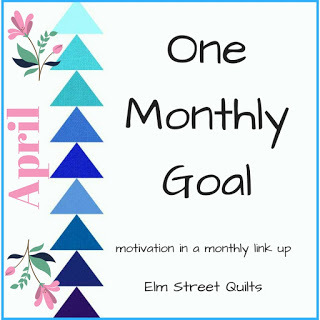 Linking up to Elm Street Quilts: April ‘19 One Monthly Goal. Looks like fun. Thanks for linking up with Elm Street Quilts One Monthly Goal and good luck with your project. Those are going to be so cute! Good for you for picking a bigger goal! (I like to do the same).